One of the annoyances of birthdays and Christmas is the assembly of overly complicated toys. If you buy smartly, however, you can avoid most of that. Just don't purchase the assembly-required Disney Princess Castle with Automated Drawbridge and Life-like Moat (TM). The more common annoyance is the impenetrable packaging of toys. Why a plastic pony or dump truck needs to be secured to the thick cardboard backing with 15 industrial-strength twist ties, a roll of tape, and a few screws is beyond me. Is it to survive the boat ride from China while retaining its attractive positioning in its hard plastic sarcophagus? A note about packaging is that in the past few years, I have noticed an improvement in the ease of getting a toy from box to frantic child's hand. For instance, some toys no longer use the wire ties that are thicker than a 10-penny nail. Instead, they use a plastic screw with a handy flange that can easily be removed without tools. The toy itself is engineered with the packaging in mind, and the holes where the screws were are hidden on the underside of the toy. I greatly appreciate the ingenuity of these improvements, though I'm sure I'm the only person in the room at a birthday party who would be caught marveling at the improvements in toy-packaging technology. I'm not sure why it has happened this way, but we so far have had to assemble few horribly complicated toys with indecipherable directions. I recall a large dollhouse (which was almost never used!) and a play structure (also never used!) that were nightmares to assemble, but other than that, it hasn't been too bad. This year, however, we got a special treat. 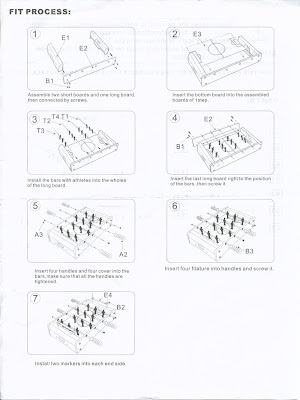 It was a seemingly simple table-top Foosball table that cost all of $25, but it took a good hour to assemble. And the best part? The instructions. CAUTIONS! 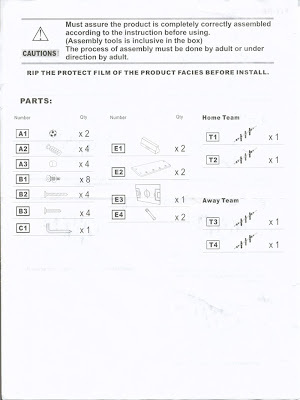 Must assure the product is completely correctly assembled according to the instruction before using. RIP THE PROTECT FILM OF THE PRODUCT FACIES BEFORE INSTALL. Step 3: Install the bars with athletes into the wholes of the long board. The best part of the directions, however, is that the designers were so detailed that they included curses where appropriate. Step 4: Insert the last long board right to the position of the bars, then screw it. Step 6: Insert four filature into handles and screw it. Filature? Luckily the picture was unambiguous. In reality, it wasn't that hard to assemble, and the color photo on the box was the biggest help, but the combination of the non-native English directions and the lack of any clear labeling of the parts made for a laughably absurd Fit Process.